I can't wait to meet you in the classroom and share my floral passion with YOU. Oh, the places you will go with this hands on floral experience......everywhere you want to go! I want to alert South Central members to the fact that we have a South Central Scholarship available that will pay for up to $2,000 in expenses to attend our annual get-together. Let your industry friends or employees, who are not AIFD members, know about its availability. It's intended for those who need nancial assistance to attend AIFD Symposium in Orange County. The scholarship is available for those who have never attended an AIFD National Symposium. The application, can be found at http://www.aifdfoundation.org/index.php/ scholarship-information. All applications are due to the Foundation by January 31. I hope everyone survived, I mean, enjoyed a wonderful holiday with friends and family! While the holiday madness may be over, things are really gearing up for us on the Rose Parade end of things. Flowers grown specifically for the Rose Parade have been cultivated, packed and shipped to the United States from Colombia and Ecuador, awaiting their final destination on one of the floats. After being harvested and packed up in South America, they make their way to Miami, their first stop in the States. Trucks pick them up at the airport and they are transported to our Miami Distribution center. ...and send them off to their final destination, California! Stay tuned for some more behind the scenes as the countdown to the Rose Parade begins! This 10 day or 2 evening + Saturday Exploration of Floral Design class will teach the basic principals of floral design, and so much more. Each day will have a morning/evening lecture and afternoon/evening of hands on designing. Students will participate in the processing and handling of fresh flowers each day for the lab session. The students will be trained to execute all basic forms of design to apply for a floral designer position. This is a required class for job placement. The class offers business information on pricing for profit, daily sales, floral delivery expenses, and bulk purchases for profitability, and so much more! The students will have an open book final exam on materials covered during lectures. And every class day will be more fun than you can imagine and the amount of flowers to work with and industry information is fantastic! 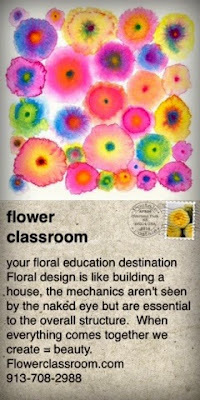 The Flower Classroom provides a Notebook of Floral information, Color Wheel, Floral design tools and a California Flower Selection guide, and industry catalogs. Students should bring something for note taking and a calculator. The classroom has assorted tools available to use, new floral tools are available in the classroom to purchase. Any other tools necessary for the class will be available. A certificate of completion of this class will be available with your final exam. Students that have enrolled and finished Explore Floral Design and wish to enroll in the Advanced Floral design class that follows will be given a discount on that class price when combining these 2 classes. Registration & Class Materials for a 10-day class or 2 evenings + Saturday for 5 weeks. Cancelation of your space in the class is allowed up to 14 days before class for a full refund. After that a credit will be applied for classes in the future. For this class or any classes of your choice. No Refund from 14 days prior and thru each class session. Smithers-Oasis North America Design Director Sharon McGukin, AIFD, AAF, PFCI, is a speaker and author known for her "edutaining" floral design tips and Southern charm. She has four decades of design experience, is past president of AIFD and lives in Carrollton, Georgia. Feasting. Shopping. Celebrating. We're all so busy that it feels like we rush through the Christmas holidays in a hurry. Don't despair, the party isn't over yet! Get busy making decorating plans for upcoming New Year celebrations and avoid the post-holiday let down. Bring out the bling, dress up the house and get ready to celebrate the biggest night of the year: New Year's Eve is almost here! Cluster a group of collectible, vintage, or quirky clocks on the mantle to remind guests to keep an eye out for the stroke of midnight. Decorate from the ceiling down. Hang metallic flag bunting, glittered lanterns, mirrored balls, glittery balloons or shiny bead curtains as a fun way to showcase an entrance, food buffet or dance area. Embellish a chandelier by dangling lengths of sequined ribbons, decorative wire, crystals, stars, fresh flower blooms in clear water tubes or flea market finds like antique jewelry pieces tied to its frame. Use spray color to change those reds and greens to golds and silvers. Pull the natural cones, fruit and Christmas décor out of your garlands and centerpieces and replace them with stars, millimeter balls, glittery sticks or tinsel. Dress up a party table with gold or silver sequined runners, placemats or tablecloths. Add chargers, place cards and your favorite china for a fancy affair. Don't forget the fresh flowers for an elegant touch! Create a centerpiece of clustered champagne flutes, margarita glasses or wine goblets filled with confetti, fresh flower blooms, noise maker horns, sparkly year numbers, brightly colored candies or fresh fruits. Gather gold, silver or black vases in the center of the table and fill them with large white and black feathers for Parisian flair. Candles, light sticks or focused pin lights can be used to highlight an area. Groupings of brass or silver candle holders filled with mixed sizes of votive, taper or pillar candles make a bold celebratory statement. The secret to getting the New Year off to a good start is to have fun doing so! Enjoy the creative process of decorating for celebrating. Use your imagination and repurpose items you already have at home and add items for an updated flair. Paint. Glitter. Foil. Bead. Ribbon. Wire. What can you use to create trendy new looks with a little time and talent? Oasisfloralproducts.com has the complete information you need, including sizes and colors, on every OASIS Floral product available. You can create a list and order where you prefer, including from the site. Just shop as you normally would, adding items to your cart. When you're ready to check out, transfer your cart to the participating distributor you select. The distributor will process your order, ship and bill you directly. It's that easy! If you have questions, ideas or concerns, please contact Customer Service at 1-800-321-8286 or support@oasisfloral.us.